NETWORK UPDATE: Once the final round of THE MASTERS TOURNAMENT was adjusted out of the numbers, all of CBS’s line-up went down, by 0.3 for 60 MINUTES (to 1.8), and by 0.1 for each of MADAM SECRETARY (1.4), THE GOOD WIFE (1.1) and BATTLE CREEK (0.7). Elsewhere, AMERICA’S FUNNIEST HOME VIDEOS gained 0.1. All hail Westeros: HBO’s GAME OF THRONES continued its amazing streak of rising year to year, with the Season 5 premiere giving the epic its biggest rating ever, up almost 0.6 from last year’s premiere to a gargantuan 4.19. Remember, only one-third of US households subscribe to HBO, so that number is actually tripled in the HBO universe. Also worth noting: that rating was achieved despite the much-reported leak of the season’s first 4 episodes online, not to mention the legal availability of the premiere on both the HBO Go and HBO Now systems. With that kind of lead-in, SILICON VALLEY’s season premiere rose 0.18 from last year’s series premiere (which also followed a GAME OF THRONES premiere) to 1.26. Things had calmed down by the time VEEP premiered at 10:30PM, and it was up 0.04 from last season’s premiere (also on that same night) to 0.55, but then LAST WEEK TONIGHT, remarkably enough, followed VEEP by more than doubling last week’s 0.32 to 0.67, proof that LAST WEEK has become destination television on its own. Woe to those who decided to compete with the Iron Throne, as the MTV MOVIE AWARDS plunged a horrific 0.75 from last year (when it aired at 9PM and against the season’s 2d GAME OF THRONES) to 0.78, with the PRESHOW down 0.31 to 0.37. Showtime also sent NURSE JACKIE into the lion’s den, and although we don’t have reliable comps for last year, on Sunday it was at an unimpressive 0.16. 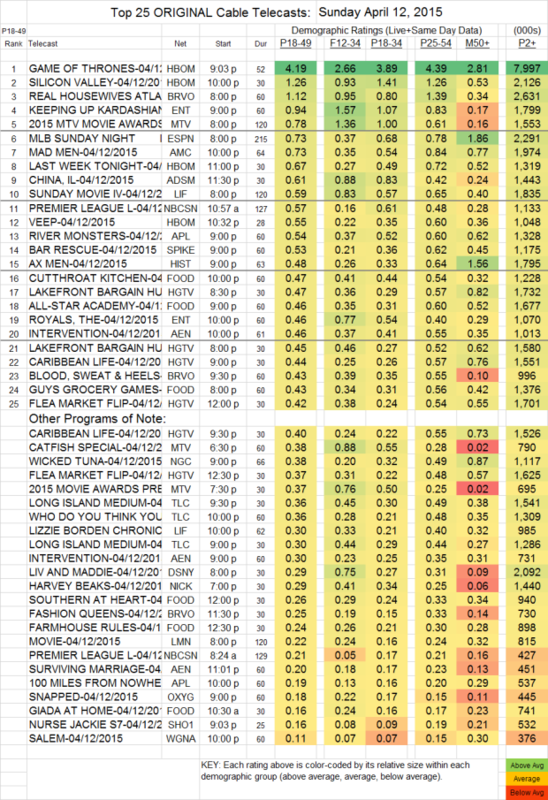 Back on basic cable, Bravo’s REAL HOUSEWIVES OF ATLANTA (which aired at 8PM, before HBO got started) dipped 0.05 to 1.12, BLOOD SWEAT & HEELS lost 0.03 to 0.43, and FASHION QUEENS dropped 0.09 to 0.25. On E!, KEEPING UP WITH THE KARDASHIANS was steady at 0.94, and THE ROYALS slipped 0.05 to 0.46. MAD MEN (AMC) dropped 0.07 to 0.73. Adult Swim’s CHINA, IL lost 0.16 to 0.61. On Lifetime, SEEDS OF YESTERDAY was down 0.03 from last week’s V.C. Andrews movie to 0.59, and LIZZIE BORDEN CHRONICLES fell 0.08 to 0.30. Spike’s BAR RESCUE rose 0.07 to 0.53. AX MEN (History) was at 0.48. SALEM (WGN America) lost half its audience, down 0.11 to 0.11.